For a full decade - from 2003 to 2013 - avian H5N1 was the undisputed king of the bird flu world. But over the past three years we've seen several new contenders for that throne emerge. The first was H7N9 - a stealth virus that doesn't harm birds but can be deadly in humans - which has cause four mini-epidemics in Mainland China since it appear in the spring of 2013. This was followed in early 2014 by H5N8 - which hasn't yet proven pathogenic in humans - but which first turned up in China and South Korean, and then cause poultry outbreaks in Japan, Taiwan, Russia, Western Europe, and North America. Also in the spring of 2014 a new reassortant H5N6 appeared at roughly the same time in Southern China and Laos, and quickly appeared in Vietnam. Unlike H5N8, H5N6 is highly pathogenic in humans. There are other, `second tier' threats, including H10N8 and H5N9, but so far they have yet to spark major outbreaks. While reporting on poultry outbreaks from China can be hit or miss - and we rarely see reports on wild birds - over the past 18 months the number of H5N6 outbreaks in poultry appears to have caught up with, and exceeded, their reported H5N1 outbreaks. 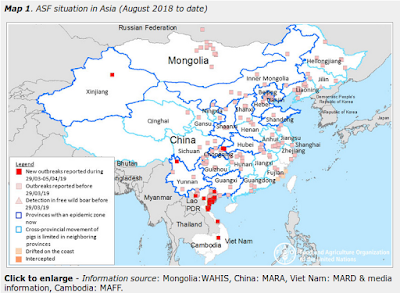 The most recently submitted (Aug 31st) OIE report on H5N6 from China lists 36 outbreaks over the past couple of years, and includes the following map. A sign of the growing spread of the H5N6 virus, from China's Ministry of Agriculture today we have a (translated) report of outbreaks from two new provinces; Hebei and Gansu. Ministry of Agriculture press office released October 8, Jinchuan District, Jinchang City, Gansu Province and Xiaogan City Xiaochang County, Hubei Province, there were two outbreaks in poultry of highly pathogenic avian influenza. October 2, Jinchuan District, Jinchang City, Gansu Province veterinary department found in monitoring a poultry farm fowl appear suspected bird flu symptoms, the incidence 30000, the death of 18 000; October 4, Gansu Province, animal disease prevention the control center for the diagnosis of suspected bird flu. October 2, Xiaogan City Xiaochang County veterinary authorities discovered a poultry farm raising poultry suspected symptoms of avian influenza occurred in the monitoring, the incidence of 4338, died 3934; October 4, Hubei Animal Disease Control Center diagnosed as suspected bird flu. October 8, by the National Avian Influenza Reference Laboratory confirmed two outbreaks are H5N6 subtype highly pathogenic bird flu. After the outbreak, according to the relevant local plan and control technical specifications, a really good job epidemic disposal work. Gansu has been carried out on 77 172 poultry culling and safe disposal, Hubei has to 2166 poultry culling and safe disposal. Currently, two outbreaks has been effectively controlled. As cooler temperatures often herald the beginning of an uptick in bird flu outbreaks - and human infections - this is the time of the year we begin to watch for increased outbreaks of avian flu. Although we only know of 15 human infections with the H5N6 virus fully 1/3rd of those cases (n=5) occurred in just over a month's time in Guangdong province last winter (December & January). During the 18 months prior to last December, only 5 cases had been reported. Between December of last year and May of 2016, that number tripled. This sudden increase is likely due to two factors. An increasing geographic range of the virus, and evolutionary changes to the H5N6 virus itself. We recently looked at the dispersal and spread of the H5N6 virus via migratory birds in Nature: Origins and Evolution of HPAI H5N6, while the recent changes to the virus was the subject of EID Journal: Novel Reassortant H5N6 Viruses In Humans, Guangdong China. The EID study found that while H5N6's HA (H5 clade 2.3.4.4) and NA (N6) genes have remained fairly stable, its internal genes have changed - as a result of continued reassortment - since it emerged in 2014. Like all influenza viruses, H5N6 continues to evolve, a process that appears to be exacerbated and accelerated by the mixing of bird species (and their viruses) at live bird markets, where new reassortant viruses can easily emerge. As we saw last August, in Emerg. Microbes & Infect. : LBM Surveillance As Early Warning For H5N6 Infection, live bird markets are likely to remain the main risk for human exposure to H5N6, H7N9, H9N2, and other avian viruses.